We came to Nah Trang just for one last dip in the ocean in scuba gear but wound up staying three days relaxing and motorbiking around. The diving itself was pretty nice, though lots of the underwater area was sandy and our dives were cut short both times. By far the highlight was the octopus we watched change colors and try to hide under a rock when we came close. 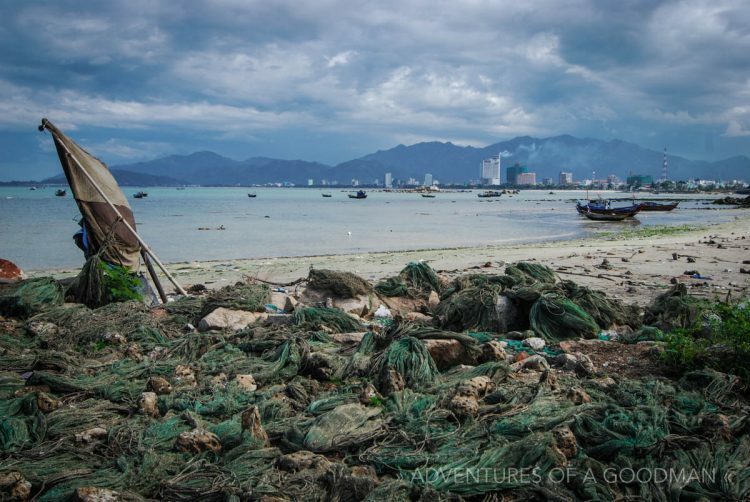 Nah Trang itself sprawls out into the distance past the beach area that is filled with tourists, overpriced restaurants and hotels. One day we walked around and checked out a wonderful exhibit of black and white photos of Vietnam at the Long Thanh Gallary before searching out the Long Son Pagoda. We avoided some scam artists at the bottom of the Pagoda before hiking up a hill to take in a massive sleeping Buddha statue halfway up and an even more massive sitting Buddha statue atop. The next day we rented a motorcycle and headed out of the city to visit the Po Nagar Cham Towers. Located on a hilltop overlooking the South China Sea and the entire town, the Towers are beautiful, red bricked and only semi-ruined. Inside each one is a shrine with some of the thickest incense smoke ever and a non-stop line of people coming in to pray. Our drive later continued along the coastline, stopping at the Hon Chong Promontory to view the ocean and the shrines on islands out in the middle of it. Finally, our motorcycle day took us to the Thap Ba Hot Spring Center, which was completely unlike anything I have ever seen. The standard 100 dong ($5.50) entry fee covered a mud bath in a tub shared with numerous Vietnamese people, a mineral bath (also in a shared area), a walk through a hot mineral water alley that shoots thin streams of water, a sit under a waterfall and a swim in a pool filled with 50 of your closest friends. There was no privacy: even for the people who spent 400 dong for a private mud and mineral bath tub. All the extra money buys is a tub free of other people in an area with at least 25 other tubs in a line next to yours. It was a completely strange experience from start to finish.